A 50th Anniversary Seiko Astron Watch! Authorised retailer for Seiko Watches. Free delivery, 30 day free returns and five-star rated service. Buy now with up to 12 months 0% finance. The vision of Seiko's founder Kintaro Hattori was "always one step ahead of the rest" and over the years they have stuck to that vision, boasting many world firsts. Seiko means "exquisite" in Japanese, so it's no surprise that Seiko watches are world renowned for quality and style. Seiko were originally founded in Japan in 1881 when Kintaro Hattori opened the K Hattori Clock Shop at the age of 21. The first clocks and watches were produced during the 1890's under the name Seikosha which means "House of Exquisite Workmanship.” Japan's first wristwatch was produced by the company, called the Laurel, in 1913. The first watches were released under the Seiko brand in 1924 and have been officially used on all watches produced by the company since 1937. The Seiko brand have become synonymous with precision timekeeping. Because of their stellar reputation they have become the official timekeeper of a number of events including 6 Olympic Games and 4 FIFA World Cups. Seiko pride themselves on their impressive array of firsts. The firsts date back to 1969 when Seiko released the first quartz watch all the way to 2012 when they released the Seiko Astron, the first GPS solar watch which is accurate to 1 second in 100,000 years. 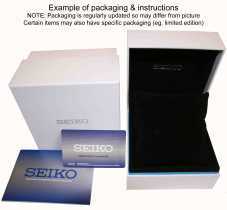 Seiko have also developed kinetic technology, the first prototype of this technology was unveiled in 1986. This technology powers your watch by your movement, making the watches in this range long-lasting and eco-friendly. No matter what you want form a watch, Seiko have it covered! Affordable and functional watches to suit all tastes are available from Seiko in all price ranges. Seiko's current range includes solar powered watches, affordable chronographs and beautiful watches in their stylish range of ladies watches. Seiko's timekeeping technologies are trusted by some of the top bodies in the world of sports. Seiko have been the timekeepers of choice for the IAAF ever since 1985. Seiko provide the IAAF with more than 40 skilled engineers and the same kind of cutting edge technology that you can find in Seiko wristwatches.